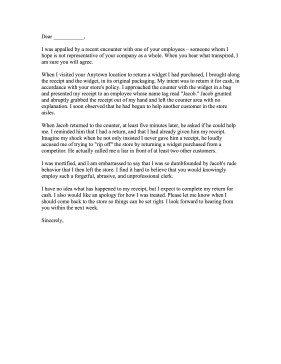 This sample customer service complaint letter cites a rude employee during a product return situation. I was appalled by a recent encounter with one of your employees - someone whom I hope is not representative of your company as a whole. When you hear what transpired, I am sure you will agree. When I visited your Anytown location to return a widget I had purchased, I brought along the receipt and the widget, in its original packaging. My intent was to return it for cash, in accordance with your store's policy. I approached the counter with the widget in a bag and presented my receipt to an employee whose name tag read "Jacob." Jacob grunted and abruptly grabbed the receipt out of my hand and left the counter area with no explanation. I soon observed that he had begun to help another customer in the store aisles. When Jacob returned to the counter, at least five minutes later, he asked if he could help me. I reminded him that I had a return, and that I had already given him my receipt. Imagine my shock when he not only insisted I never gave him a receipt, he loudly accused me of trying to "rip off" the store by returning a widget purchased from a competitor. He actually called me a liar in front of at least two other customers. I was mortified, and I am embarrassed to say that I was so dumbfounded by Jacob's rude behavior that I then left the store. I find it hard to believe that you would knowingly employ such a forgetful, abrasive, and unprofessional clerk. I have no idea what has happened to my receipt, but I expect to complete my return for cash. I also would like an apology for how I was treated. Please let me know when I should come back to the store so things can be set right. I look forward to hearing from you within the next week.